Zōri (草履?) are flat and thonged Japanese sandals made of rice straw or other plant fibers, cloth, lacquered wood, leather, rubber, or—increasingly—synthetic materials. 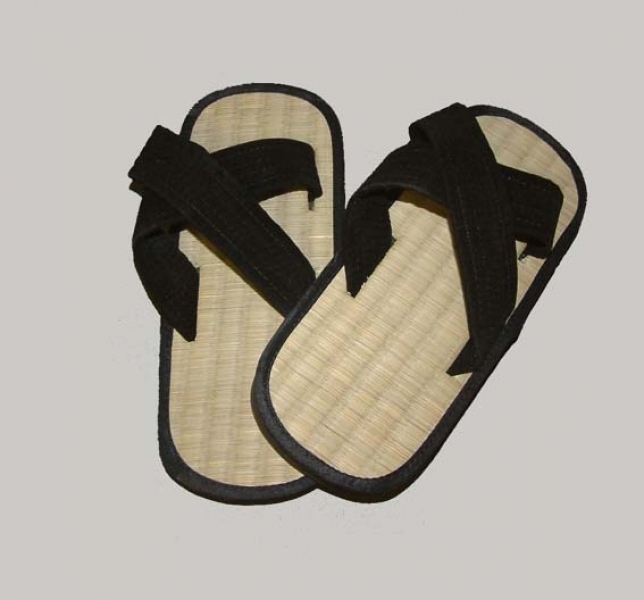 Zōri are quite similar to flip-flops, which first appeared in the United States sometime around World War II as rubber imitations of the wooden thong sandals long worn in Japan. The traditional forms of zōri are seen when worn with other traditional clothing; modern forms are fairly common, especially in summer. 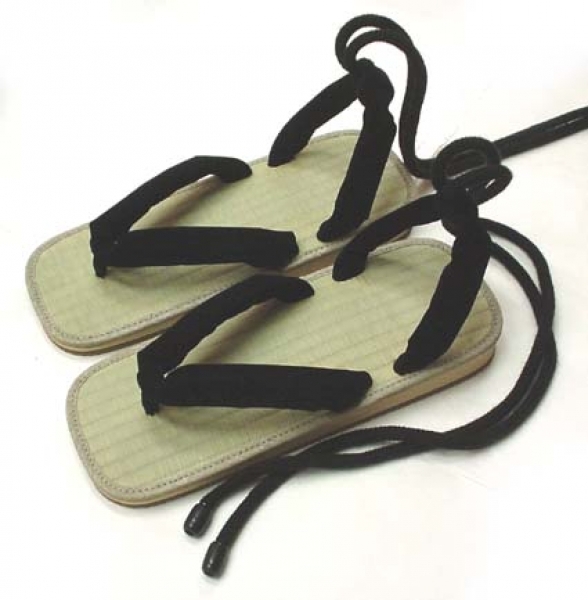 While geta are nowadays worn with the informal yukata, zōri are associated with the more formal kimono. The formality of the occasion affects the choice of kimono and zōri. The bulrush covered zōri that resemble tatami mats are not used with kimono, but are considered working wear or matched with casual Western or Japanese clothing, for example jinbei. Thus they rank close to the wooden geta. Women's vinyl (plastic) zōri are formal, but less formal than fabric, sometimes brocade covered zōri, that are used with the most formal of kimono, for example, wedding and funeral wear. Men's zōri are often plastic straw imitation, with foam or cork soles. The hanao, or thongs, for men are often white or black. Women's zōri can also be of straw imitation, but the hanao are usually red, and they rank below colored vinyl or brocade zōri in formality. As formal wear, all plastic and fabric zōri for women require the use of white tabi socks. Men have more latitude, and can use the same imitation zōri with both informal (without tabi) and formal wear with tabi socks. The hanao is attached symmetrically, so there is no difference between left and right shoe. The hanao of zōri can be made of velour-like material, as in the case of plastic straw imitation zōri. The hanao for more formal coloured vinyl zōri are either thin vinyl or brocade straps, or wider and padded vinyl or fabric straps. The fabric is often either the fabric used for the shoe, or chirimen, crepe-like Japanese silk or rayon fabric. Men's zōri might also feature leather or leather imitation hanao. The hanao wear and stretch easily, and the hanao fashion and the coordination of accessories sometimes calls for replacing the hanao. The hanao can be replaced through flaps of the sole. Women's zōri are seldom flat, except for the straw imitation zōri. The soles come in different thicknesses and angles. There are even modern zōri that are left uncovered by fabric or vinyl, and the shoe, except for the inner sole, is black, hard plastic with a non-slip outer sole. Usually the outer sole is grey, genuine leather. Like all Japanese sandals, zōri allow for free circulation of air around the feet, a feature that probably came about because of the humid climate that predominates throughout most of Japan. They are easily slipped on and off, which is important in a culture where shoes are constantly removed and put back on. In a tight kimono tying shoelaces would be impractical, which serves as one explanation for the triumph of the thong shoe in Japan. Here are some examples of images related to this term. The content has been sourced by searching Google for: Zori + Aikido. This means that we do not really have any control over the results and that sometimes they may not even be relevant. Please take a look at some example videos related with this term. The content is pulled from YouTube by searching for term: Zori in category Aikido. Please keep in mind, that it might not be relevant.